A Key Signature consists of Sharps and Flats which are placed at the beginning of every Stave of Music to fix the correct pitch of the piece. To understand them fully, it is necessary to have a good understanding of the Major and Minor Scales. But first, check out the following video which looks at the very basics of understanding this concept. As you move further down the page, I have included Parts 2 and 3 of the series by 'musictheoryguy'... great music theory viewing. Key Signatures - Where & Why? 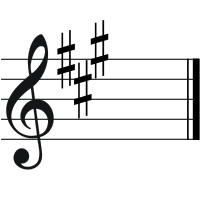 Key Signatures are generally written immediately after the clef at the beginning of a line of musical notation. Without them, there could be 'utter chaos' on the Stave especially if you are playing a piece with a lot of sharps or flats in quick time. The following examples will help to illustrate this. In this example, the piece is in B Major which consists of 5 sharps F# - C# - G# - D# - A#. Every time one of these 5 notes is played, it has to have a sharp in front of it, as there isn't a Key Signature at the beginning of the piece to tell us otherwise. In this example, the piece is still in B Major but has a Key Signature. It fixes the correct pitch of each note within the piece. If there is an F# in the Key Signature, every time you play an F in the piece, it will be F#. The same applies to the other 4 sharps. (C# - G# - D# - A#)... neat, sweet and complete. Imagine trying to play this piece of music without one! There is an order that sharps and flats are placed on a musical Stave. 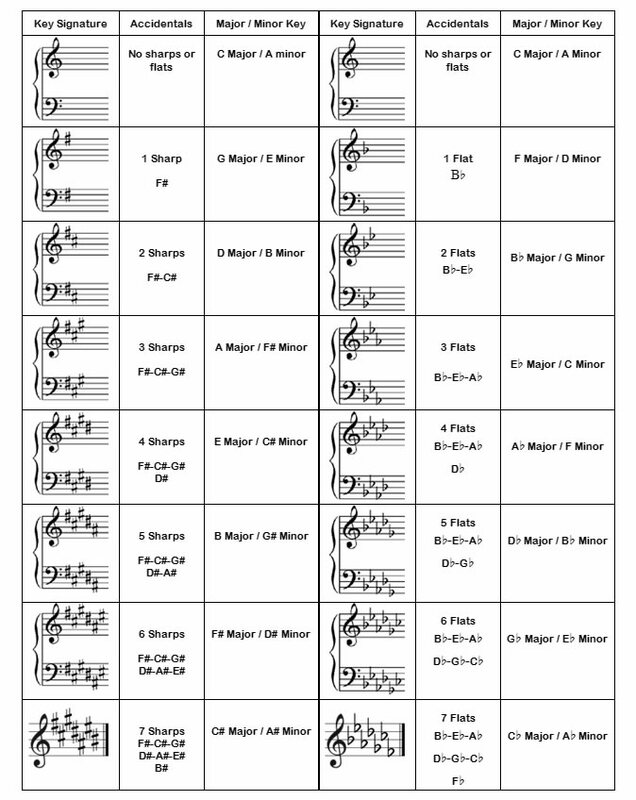 Major and Minor keys up to 3 sharps or flats..